We seek to make disciples that: BELIEVE in Jesus, MATURE in faith, and INVITE others to do the same. BELIEF begins the spiritual process, so it begins our DISCIPLESHIP process. How this works out practically is that we teach, vision cast, and act with the unbeliever in mind - especially in our Sunday Service. We seek to use plain language, be know for our transparency and authenticness, be well-informed, and be non-judgmental. We seek to allow those seeking God to belong, even before they believe. We also seek to make sure that nothing offends people in our weekend service except the Gospel. 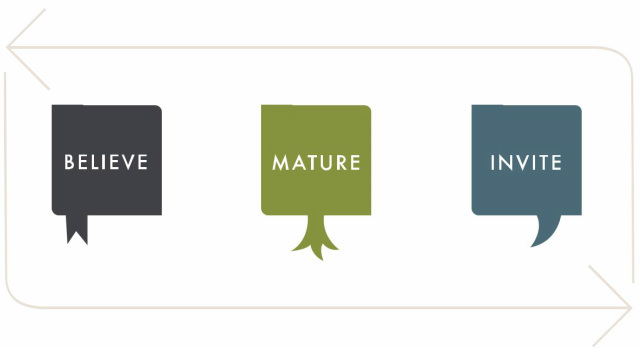 After the initial step of belief, we are called to spiritually MATURE in our faith. How this works out practically is that we like to focus on the spiritual disciplines (prayer & Scripture), serving others (both inside and outside the church, as well as giving), and committing to one another in relationships - especially in Grace Groups. It is in the context of these small groups that we look to one another for encouragement and being spurred onto become more and more like Jesus (i.e. Maturity). Once we come to Jesus, it is both a delight and a discipline to INVITE others to do the same. How this works out is: (a) We seek to create a culture of Personal Evangelism. Overwhelmingly, the #1 way individuals come to know Jesus is through personal (relational) evangelism and we seek to encourage and equip our members to do so. And, (b) We seek to partner with Local & Global Missionaries to spread the Good News. We financially support many missionaries and serve them both locally and through mission trips.